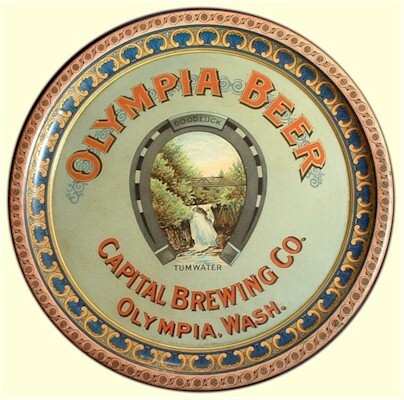 Featured is a great Capital Brewery Company Pre-Prohibition beer serving tray from the Olympia Washington area. This tray features the trademark Olympia horseshoe in the center with running water. 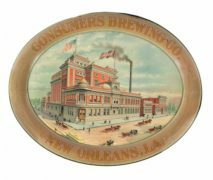 Featured is an amazing serving tray from the Union Brewing and Malting Company in San Francisco, California, circa 1915. 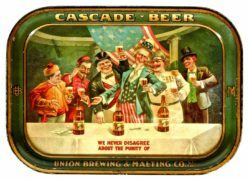 This great pre-prohibition tray features Uncle Sam enjoying Cascade beer with his friends! 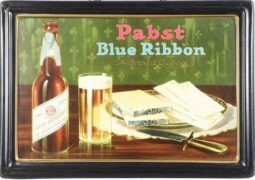 Featured is a nice tin over cardboard beer sign, from the Pabst Blue Ribbon brand in Milwaukee, Wisconsin. This beer was made in Milwaukee and continues to be made even today. Early self-framed tin signs are highly sought after by collectors today. 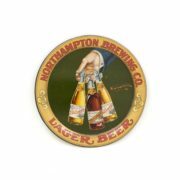 Featured is a beautiful tip tray from the small Northhampton, Pennsylvania Brewing Company. 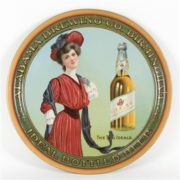 This tray is from about 1910, and is a pre-prohibition rarity. Featured is an outstanding reverse-on-glass style advertising sign from the American Brewing Company, this one in Baltimore, Maryland. The glass is beautifully centered inside a wood gesso style frame. This pre-prohibition era sign is from about 1900. ABC Beer Brand, American Brewing Company, St. Louis, MO. Paper lithgraphic sign. 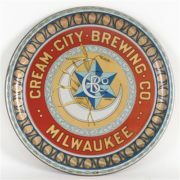 Cream City Brewing Company of Milwaukee, Wisconsin tin pre-prohibition serving tray. Circa 1910. 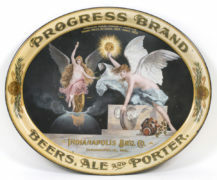 Featured is an early pre prohibition serving tray from the Indianapolis, Indiana Brewing Company for their Progress Brand of beer, ale and porter products. 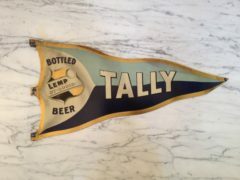 Featured is an early tin sign from the William J. Lemp Brewing Company in St. Louis, MO for their Tally brand of bottled beer. Joseph Schlitz Brewing Company Buck Beer lithographed goat in a man's suit poster. Circa 1900. Milwaukee, WI. Featured is a beautiful metal or tin serving tray from the Deer Park Brewery in Port Jarvis, New York, circa 1910. 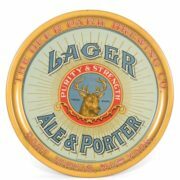 This tray shows their varied products, lager beer, ale and porter products. Pictured is a beautiful serving tray from the Birmingham, Alabama Brewing Company for their Ideal brand of beer. This metal serving tray is a pre-prohibition era tray, circa 1910.